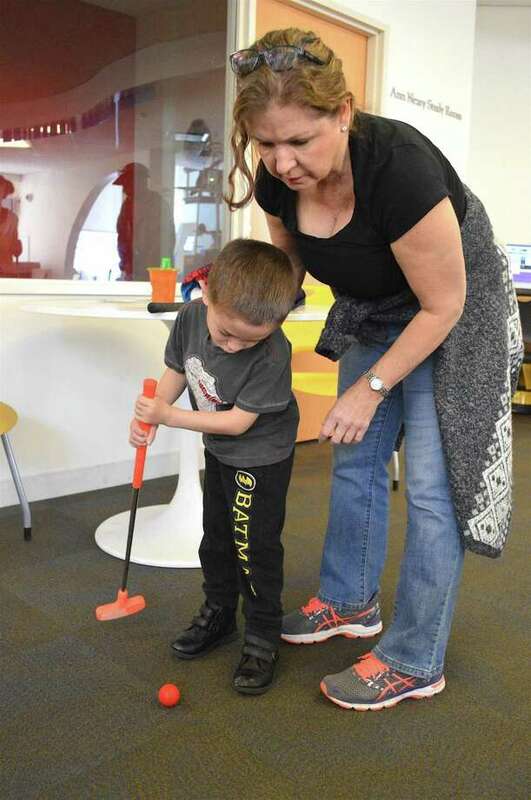 Beverly Makar of Fairfield helps her grandson, Matt Makar-Winslow, 4, learn to play at the Fairfield Library's Mini Golf fundraiser, Sunday, Apr. 2, 2017, in Fairfield, Conn.
FAIRFIELD — Friends of the Fairfield Library really had things rolling Sunday morning with a mini-golf fundraiser at the main library. “This is our first year here,” said Jacqui Coghlan, event chaired, noting the Fairfield Woods branch had hosted it for a few years but they wanted to try a bigger venue.